Rev. 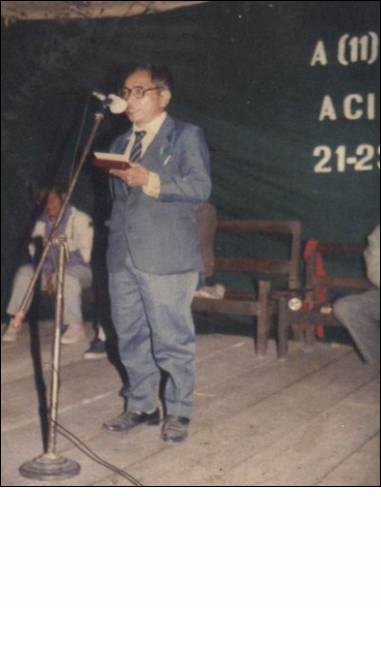 Dr. Samuel Nang Khan Do, who has gone to be with the Lord on 18th March, 2007 is a man of God, a theologian, a physician and a philosopher as well. As promised before his death, an honorary DMin degree is given to him as a posthumous award in December, 2007. A copy of the DMin degree of Rev.Dr.Samuel Nang Khan Do, awarded in December, 2007 will be posted here later. Rev.Dr.Samuel Nang Khan Do i taangthu thei nuam maw? Hiah click in. I was shocked to hear of the sad demise of Rev. Dr. Samuel Nang Khan Do, your husband. I know the magnitude of the shock received by all of you. Words fail me to express those feeling here. The loss is irreparable. I would ask you to face this calamity with courage. According Dr. David Ngin Sian Pau, I came to know him and his life time commitment for the Lord two years ago. As per the requirements of Cosmos International University, we consider that he should be awarded the honorary Doctor of Christian Ministry (D.Min.) by asking him to write an autobiography translated in English. Though he has not finished his autobiography writing, he meets the requirements of the university by fulfilling 30 years of serving the Lord in pastoring Baptist churches in Chin State and Kale Myo, Myanmar, doing development in the community he lived in by running private schools for the benefit of others, building different Baptist churches, helping and looking after many patients by giving them medicine at the lowest price possible, running drug stores for the benefit of the community and his age is over 60 years now. We found him worthy of honor and respectable in his service, his heart and mind in Christian ministry. Therefore, as per assessment committee decision, Rev. Samuel N.K Do, the honorary president of Christian Development International Ministry will receive the prestigious Doctorate degree of Christian Ministry from Cosmos International University. To receive the D.Min. we plan to notify him the opportunity to come to United States in the first week of June, 2007, six months before December 2007. But still the decision is not pending and we will offer him the Honorary Doctor of Christian Ministr( D.Min.) in December, 2007. Therefore, though he is no more with us, we will offer him the Doctor of Christian Ministry this year. Thus, we, on behalf of Cosmos International University, express the deepest sympathy to you all. Click the link below for the video.